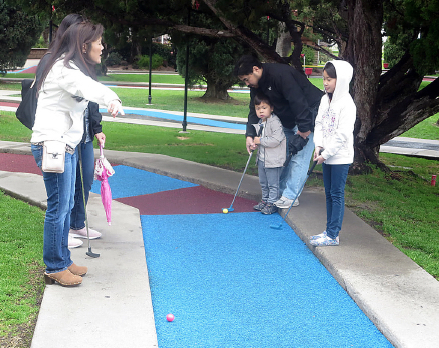 A family affair: Participants in the Rising Stars 15 Miniature Golf Tournament at Golfland in Anaheim. Join us on Saturday, March 9, from 9 a.m. to 2 p.m. for the annual Rising Stars Youth Leadership Miniature Golf Tournament at the Camelot Golfland, located at 3200 Carpenter Ave., Anaheim. Check-in begins at 9 a.m. with a 10 a.m. shotgun start. This tournament is packed with all-day fun for the entire family and for a great cause: to help keep the Rising Stars Program around for future leaders. On top of an exciting round of golf, there will be a raffle for all golfers to enter. This year’s top raffle prizes include a Go Pro Hero 7, Fitbit, and a gift card tree. Other items will be raffled off as well. Raffle tickets are $2 and the winner need not be present to win. Building off of the groundwork paved by the Building Community Through Leadership (BCL) program in 2003 for members of community service organizations, the Rising Stars Youth Leadership program seeks to develop leadership skills in youth and encourage active participation within the Japanese American community in order to build leaders for the future. The program continues to grow and starting with RS13, a new workshop and outing activity was added to the program to further enrich the purpose of the Rising Stars experience. The golf tournament is in fact organized and put on by students in Rising Stars. The tournament serves as a means for the students to apply what was learned during each session and apply these learned skills in the real world. Christopher Guerra is a senior who attends Glen A. Wilson High School in Hacienda Heights. A Rising Stars 16 Youth Leadership Program participant, he is interested in developing leadership skills for college prep and wants to learn more about the Japanese American culture. He is involved with the community through sports, including basketball, baseball and volleyball, and has volunteered at community organizations, church and Japanese school. His brother Jonathan is a sophomore also Wilson High School and is participating in RS 16 this year.